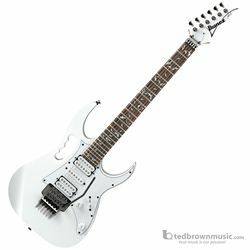 The JEM-JR is Ibanez's most affordable option in Steve Vai's signature JEM series! Take advantage of all the great features of Ibanez's best selling JEM guitars: contoured basswood body, unique styling, easy access to all registers, and total playability. The deep-routed Lion's Claw tremolo cavity lets you take your pitches to screaming highs, and bring them to obscene depths. It wouldn't be a Steve Vai signature JEM otherwise.